The life cycle of a fly is made up of four stages; egg, larva (maggot), pupa and adult (fly). The length of this cycle is variable. In high temperatures developing from egg to larva can take as little as 8-16 hours. Flies are also vulnerable to changing weather conditions, a small increase in temperature can lead to a rapid growth in the density of the housefly population. Flies are attracted to odors and will lay their eggs in moist or decomposing material. They are especially attracted to materials with high protein content such as meat and fish. The majority of maggots that are found in wheeled bins usually originate in the kitchen. Eggs are laid on food that has been left uncovered, and this waste is then transferred to your green non-recyclable waste collection bin where the eggs then hatch into maggots. The best method of controlling the fly population is to break the breeding cycle by limiting the areas where they may lay eggs. Maggots can be a common problem during warm spells. 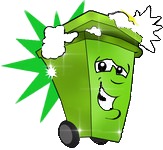 Keeping your bin clean and disinfected will help to keep your bins maggot free. Wrap meat and fish items in﻿ newspaper ﻿before placing into your green wheelie bin. This will slow down decomposition and prevent odours from escaping. Ensure you keep the lid of your wheelie bins closed to avoid flies being able to enter the bin and lay eggs. this will prevent food waste from sticking to the sides of your containers and help contain any odours. Use of fly paper / insecticides may help to reduce any fly problem. Please use sprays in a well ventilated area and according to the product instructions. Chopping scrap food waste before placing it in your silver kitchen caddy encourages the material to break down and decay more quickly. By not chopping down this waste you will reduce the number of flies attracted to your container. Dispose of liquid / very sloppy food waste via the sink. This will prevent moisture occurring in your food waste containers and help control fly infestations. Tip the contents of the bin into plastic sacks and knot or seal tightly. Place the plastic sack into your green wheelie bin ready for the next collection. The maggots should not be able to escape. Disinfect your bin with strong smelling disinfectant and hot water. Recycle as much as you can so that there's less in your bin and the lid can be kept shut. Keep the bin out of direct sunlight (this makes the waste slower to decompose, reduces smells and slows the development of maggots etc.). Don't leave waste food lying around inside the home before putting it in the bin, as flies can lay eggs on it during this time. Uncovered bins inside the kitchen can also allow flies to lays eggs on waste food. Squeezing the air out of bags that contain food waste before they are tied and put in the bin should also slow down decomposition etc. Don't leave dog/cat food out uncovered - again because flies can lay their eggs in it. Bag all pet waste before putting it in your bin, or place it in one of the pet waste disposal bins situated on public areas around the District. Good hygiene in the home is the best way of preventing the spread of disease and infection. Flies are all around and have the potential to spread disease, no matter what type of refuse collection service is in operation. Clean your bin and use detergents to reduce problems. Maggots will only appear in the bin if the eggs have been laid in a suitable food source for them to develop. If bins are kept closed, flies should not be able to enter to lay their eggs. Therefore, if maggots do appear, the eggs are likely to have been laid before the food was put in the wheelie bin, especially if it isn’t wrapped in paper or bagged when put in the bin.